We’d love your help. Let us know what’s wrong with this preview of Guardians of the Heart by Loree Lough. To ask other readers questions about Guardians of the Heart, please sign up. Question, dear readers.... If you win this book, are you willing to share the reasons this giveaway captured your attention? Becky Yes. The cover and teaser made me want to learn more. This is one of those books that once I started, I settled in and had a hard time putting down. It's set in the late 1800's. Asa Stone left Denver years ago after a family argument and has now returned but has secrets which make him believe he doesn't deserve happiness. His plan is to restore his grandparents' inn, Stone Hill. Nell Holstrom is looking for a new job and Asa hires her as the housekeeper for his inn. Together, they work hard to restore it to its former glory. Just when things are go This is one of those books that once I started, I settled in and had a hard time putting down. It's set in the late 1800's. Asa Stone left Denver years ago after a family argument and has now returned but has secrets which make him believe he doesn't deserve happiness. His plan is to restore his grandparents' inn, Stone Hill. Nell Holstrom is looking for a new job and Asa hires her as the housekeeper for his inn. Together, they work hard to restore it to its former glory. Just when things are going well, something disastrous happens which drastically changes their plans. I loved Asa and Nell! Asa puts on a rough front but does care about others while trying not to. He feels guilt for some things he did in the past and needs to learn to forgive himself. Nell was sweet from the beginning! What I loved about this book is that the author didn't just tell me; she showed me. Nell had to leave the home she was in at the beginning and she could have been bitter, but she wasn't. In fact, she left the furniture she had purchased for the next tenant to help her feel more at home. When she was cleaning out the inn, she found Asa's grandfather's old pipe, and gave it to him rather than throw it away. It brought back good memories for him so he was excited to have it. There were other instances like that throughout the book. Her life wasn't easy and she wasn't perfect but she made the most out of her situation. I absolutely fell in love with her! I was loving what was going on at the beginning and then it took a sad turn and I felt devastated for them. As time went on, though, they came up with a new plan and were able to make it work. What they wound up with in the end was better than what they had in the beginning and I liked that, too. Sometimes in life, a bad situation can actually be the best thing for us in the long run. This is Christian fiction so there are faith elements throughout the book. It's a book anyone will love that enjoys a good, clean, faith-based romance. It's also the second book in a series but I didn't realize that until I started writing my review, so it works very well as a stand alone novel. This author is new to me but I will definitely read more of her work in the future (and she has lots of books out so there's plenty to choose from)!! Nell Holstrom and Asa Stone both have suffered hardships, heartaches and secrets in their past and are now trying to build a “new” life. Nell is one determined woman and a hard worker—who sings while she works. She seems to be good at anything she turns her hands to. Asa is as much a hard worker as Nell, but is a man of few words. Circumstances bring Asa and Nell together to restore the old Stone Hill Inn that Asa inherited from his grandparents. Disaster strikes leaving them both stunned. It was fun to watch the interaction between Nell and Asa as they worked together. I was hoping they would forgive themselves of their pasts, allowing God to heal their broken hearts and find love. I love Nell's heart for others and the way she freely gave of herself for others benefit. My heart ached for Asa and the guilt and pain he carried around. Asa's friend Ambrose is a sweet, gentle giant of a man that captured my heart. The characters are true-to-life that holds the readers attention from the first page to the last. Of course, like any good book, there are characters that are not so likeable and this story is no exception. The historical setting is perfect for this story line and the details are such that I could picture it in my mind as I read. Unexpected surprises, twists and turns, mystery, guilt, grief, redemption, faith, danger, romance and love are all woven together in such a way to create a remarkable story. Nell is a wonderful character. Life has thrown her some hard curves, somehow she manages to pull herself together and make the best of every situation. Her determination and loving heart not only brighten her life, but the lives of everyone around her. Asa keeps to himself. He has a past that he isn't proud of. Some of the things that bring him shame, I think are noble characteristics. He took a stand when he felt like situations were wrong, but they weren't decisions expected of him. He has a no Nell is a wonderful character. Life has thrown her some hard curves, somehow she manages to pull herself together and make the best of every situation. Her determination and loving heart not only brighten her life, but the lives of everyone around her. Asa keeps to himself. He has a past that he isn't proud of. Some of the things that bring him shame, I think are noble characteristics. He took a stand when he felt like situations were wrong, but they weren't decisions expected of him. He has a noble heart and is a strong and trustworthy man. His secrets hold him back and keep him from having the life he desires to live. Loree Lough has written this story in an easy to read voice. The pacing is excellent. She kept my attention and I really came to like the characters. Loree Lough in her new book, “Guardians of the Heart” Book Two in the Secrets on Sterling Street series published by Whitaker House brings us into the lives of Nell Holstrom and Asa Stone. From the back cover: Nell Holstrom wanted no part of her grandfather’s barren gold mine that had taken the lives of her mother, father, and younger brother; even if there may still be hidden wealth inside. Instead, she went to Denver and took a job as housekeeper at the old Stone Hill Inn. Asa Stone was barely m Loree Lough in her new book, “Guardians of the Heart” Book Two in the Secrets on Sterling Street series published by Whitaker House brings us into the lives of Nell Holstrom and Asa Stone. Asa Stone was barely more than a boy when his father dragged him and his brothers to fight with Colonel John Chivington. But Asa refused to participate in the raid on the peaceful Cheyenne and Arapahoe; and when the smoke cleared, his father and brother lay among the slaughtered. Besieged by guilt, Asa wandered the West for years before returning to Denver to rebuild the old inn he’d inherited. Together, Nell and Asa work hard to restore Stone Hill. But when disaster hits the inn, Asa retreats into despair and Nell is forced to return to her family’s mine. Asa faces the hard fact: He’ll never be the man Nell deserves. Can he overcome the dark secrets of his past? And will Nell still love him when she learns the truth? Asa Stone owns the old Stone Hill Inn. Nell answers the ad Asa places for a housekeeper. Together they are working to build the Inn back to its former glory. Just like in real life there are ups and downs so these two experience ups and downs as well. Here is the situation: both of them have trauma, both of them have secrets. Both of them need to have a healing if they are ever going to be able to move on or even finish the project on the Inn. You might not think it but this is a really interesting story filled with twists and turns you just do not see coming. Ms. Lough has managed to weave the romance between Asa and Nell in such a way that it just captivates you. She makes you care for all the characters, secondary or not, and their journey. I recommend that you don’t start this book late at night because it will cost you sleep. Janet Sinclair in this book is ME!!! It doesn't say Janet "Dowell" Sinclair in the story, but I just want all my friends to know it is ME if y'all buy the book! Loree never disappoints. This book is an eye catcher from the start. Her characters feel like friends and you feel as if you are part of the story. Asa Stone is forced by his father to fight in a war along with his three brothers . Branded a coward when he escapes the control and manipulation of his father, he wanders around for years "lo Janet Sinclair in this book is ME!!! It doesn't say Janet "Dowell" Sinclair in the story, but I just want all my friends to know it is ME if y'all buy the book! Asa Stone is forced by his father to fight in a war along with his three brothers . Branded a coward when he escapes the control and manipulation of his father, he wanders around for years "lost" working for food and board. He has always wondered what happened to his dad and brother. He finally comes home to Denver to take care of his Grandparents. When they pass away, Asa inherits Stone Hill Inn. He places an ad on a bulletin board for a cook and housekeeper. Nell Holstrom is very attractive and has worked for and lived with Joe and Michelle Dimaggio, the local storekeepers, for years. When Michelle's mother comes to live with them, Nell feels like she needs to find another place to stay so she answers Asa's Ad for a Cook and Housekeeper. She is very pretty, sweet, and hardworking. Her father owned a gold mine. He was a dreamer who always believed the next "find" would be the "BIG" one. Her family always struggled because his head was always in the clouds. Janet Sinclair is the pretty widow of Brad Sinclair. She is the town librarian who loves everybody and always willing to help out a friend in need. She loves spending time with her best friend Nell. Janet has developed feelings for the local doctor, Amos. She does not want to admit it because she still loves Brad. Dr. Amos is the town's doctor who is young and good-looking. He genuinely cares about everyone. He is sweet on Janet but is reluctant to make a move because he is not sure if she is ready to move on. It is obvious to everyone but Amos and Janet that they care for each other. Loree Lough writes books that make you want to curl up with a quilt and tuck away into the time period. Guardians of the Heart is no different. The characters feel like real people (some of them are, in fact, as they were modeled after the author's pastor as well as winners of a contest! ), and the situations - though set in the late 1800s - are historical versions of things that any of us could face today. The added bit of suspense/mystery gives the story just the right boost - both in intrigue Loree Lough writes books that make you want to curl up with a quilt and tuck away into the time period. Guardians of the Heart is no different. The characters feel like real people (some of them are, in fact, as they were modeled after the author's pastor as well as winners of a contest! ), and the situations - though set in the late 1800s - are historical versions of things that any of us could face today. The added bit of suspense/mystery gives the story just the right boost - both in intrigue and in heart. While Guardians of the Heart can easily be read as a stand-alone novel, it was nice to catch up with several characters from the first book. They fit seamlessly into this story, however, so someone who has not read the first book would have no trouble following along. Bottom Line: A sweet heartfelt romance that reminds us of the importance of forgiveness - of other people and especially of ourselves. With true, likable characters and a plot brimming with all the great elements of a story, Guardians of the Heart will gently refresh your soul. I give Guardians of the Heart 5 out of 5 stars! A sweet easy read that I thoroughly enjoyed. The main characters are so easy to like, and they become my friends as I followed their journey. They both had rough pasts that strongly affect their present situations. The banter and teasing between the two was incredibly enjoyable and fun! I love that this book held a few twists and turns I didn't see coming. Although, I have to admit the last one wasn't a surprise. The historical setting is interesting, but it in no way drives the plot. The charact A sweet easy read that I thoroughly enjoyed. The main characters are so easy to like, and they become my friends as I followed their journey. They both had rough pasts that strongly affect their present situations. The banter and teasing between the two was incredibly enjoyable and fun! I love that this book held a few twists and turns I didn't see coming. Although, I have to admit the last one wasn't a surprise. The historical setting is interesting, but it in no way drives the plot. The characters are front and center in this story with wonderful secondary characters. I truly enjoyed this read and refused to put it down until I found out how the happily ever after was going to happen! Not like I thought, but it was even better. Get your hands on this one for a wonderful read where a young man falls in love with a woman of whom he thinks he is not worthy. Enjoy the journey! Acclaimed author Loree Lough has once again created a beautiful and touching story in her second instalment of the Secrets of Sterling Street, Guardians of the Heart. This novel will touch readers’ from page one as they enjoy the enthralling journey of the relationship between Nell and Asa blossom from trust and friendship to possible love. Throughout the novel Loree has brought her characters to life in a true and heartwarming way. I would recommend this novel to Christian, historical fiction, Acclaimed author Loree Lough has once again created a beautiful and touching story in her second instalment of the Secrets of Sterling Street, Guardians of the Heart. This novel will touch readers’ from page one as they enjoy the enthralling journey of the relationship between Nell and Asa blossom from trust and friendship to possible love. Throughout the novel Loree has brought her characters to life in a true and heartwarming way. I would recommend this novel to Christian, historical fiction, romance readers. Asa had a hard young life and secrets in his past he is feels a lot of guilt. He is rebuilding the inn his grandparents left him. Nell comes to work for him as a housekeeper. Just after they get the inn restored, a disaster happens. Nell has something ( her grandfather mine) that may be able to help but after her mother, father and younger brother had lost their lives there she was scare about trying it. After the disaster happens, will she find a way to help? This is a book set in the late 1800's. I love to read books for that time period , I always learn something about history. I enjoyed this book very much. This is a 2nd in a series but can be read as a stand alone book. The character from the first book is in it but not much and it is not continued. A whole separate story. As always Loree Lough does not disappoint her readers! Guardians of the Heart , the second book in the Secrets on Sterling Street series, tells Asa and Nell's story and how we need to stop thinking we're not deserving of God's forgiveness. Nell Hollstrom needs a job and a place to live and she's about to give up when she notices an add for a cook/ housekeeper . Asa Stone is working hard to fix up the family inn in hopes of a fresh start and carry a heavy load of guilt that he feels he deserves . As always Loree Lough does not disappoint her readers! Guardians of the Heart , the second book in the Secrets on Sterling Street series, tells Asa and Nell's story and how we need to stop thinking we're not deserving of God's forgiveness. Nell Hollstrom needs a job and a place to live and she's about to give up when she notices an add for a cook/ housekeeper . Guardians of the Heart is the second book in the series, but can be read stand alone. I enjoyed this book and loved how Nell and Asa looked at life. Although they viewed it on the opposite spectrum, it made them more realistic to me. Nell doesn't life let get her done and she reminded me of Paul's statement of learning to be content in all things. Although Asa is more pessimistic, his past justifies his viewpoint, at least in his eyes. I enjoyed watching him go through the healing from past hurt Guardians of the Heart is the second book in the series, but can be read stand alone. I enjoyed this book and loved how Nell and Asa looked at life. Although they viewed it on the opposite spectrum, it made them more realistic to me. Nell doesn't life let get her done and she reminded me of Paul's statement of learning to be content in all things. I know that when I start one of this author's books that it's is going to be a good one and this one didn't disappoint. I was pulled into the story line and the lives of the characters from the first pages and didn't want to put it down after I had started it. It is a wonderful combination of romance, action, and faith that made for an very enjoyable read. This is another one from this author that I definitely recommend to anyone who enjoys good Christian historical fiction. Loree Lough's novel Guardians Of The Heart is the tale of two broken people who must learn to trust again. Forgiveness of self and accepting forgiveness from others is the theme of this book. I enjoyed the characters and the way they interacted with each other. Set in Colorado in the late 1800's, Nel and Asa are boss and employee. Can they ever be more? I really enjoyed relaxing in the evening with this book. I was given this book by Bookfun.org for review purposes. All opinions are my own. Guardians of the Heart is the second installment of the Secrets on Sterling Street series and the first book I have read by Loree Lough. What a fabulous read! I cannot wait to go back and read Currency of the Heart. I, also, look forward to more by this author. I received this book from bookfun.org in exchange for my opinion which was given. Deb’s Dozen: Two hurt and lonely people work together to accomplish their individual goals. Am I blessed! Another Loree Lough book! Guardians of the Heart is Book Two of the Secrets of Sterling Street Series. Like the first book, the ending of this historical romance is predictable, but how the characters arrive there is the fun of the read. Nell Holstrom has lived a life of poverty and want, but now has found a sanctuary and employment with the DiMaggios in their store. However, Michelle’s mother Deb’s Dozen: Two hurt and lonely people work together to accomplish their individual goals. Nell Holstrom has lived a life of poverty and want, but now has found a sanctuary and employment with the DiMaggios in their store. However, Michelle’s mother, Maria, is coming to live with them and will need the tiny apartment Nell has been calling her own. Joe tells her that Asa Stone has an ad up for a housekeeper for the Stone Hill Inn, which he is refurbishing and hoping to reopen. Nell approaches Asa for the job and is immediately hired. He’s taken note of her as she’s worked at DiMaggio’s and is intrigued by her cheerful nature, not to mention her beauty. Talking with Joe, he discovers she does a multitude of tasks at DiMaggio’s and is certain he’s made the right decision. In an attempt to make the transition easier for her, he fixes up the storeroom at the back of the Inn for Nell. When she arrives, Nell is pleasantly surprised at the accommodations and immediately sets out to make the room, the kitchen, and the rest of the house livable and homey. Asa keeps working on restoring the Inn and Nell keeps working at trying to make him talk to her. Taciturn by nature, and harboring a dark secret, Asa tries to tamp down his growing attraction for Nell. Nell works harder and harder trying to win Asa’s approval. You will love these two and the way they complement and spark off each other. Well-developed, as most Loree Lough characters are, you’ll want to keep reading to learn more and more. The characters from the first Sterling Street novel, Currency of the Heart, pop in and out and endear themselves further to you. The only fault I could find with the story is the ending. I feel the ending was rushed—I wanted more detail about the events that occurred at the end. Guess I’ll have to wait for Book Three! Guardians of the Heart rates Four Stars and is well worth the read. Loree Lough is a prolific writer who has nearly five million of her books in print. In March 2014, she added her one-hundredth book to her shelf. Congrats, Loree! She shares her hard-earned wisdom about writing and the business of writing at conferences all over the country. She splits her time between their tiny home outside Baltimore and their even tinier cabin in the Allegheny Mountains. She shares her life with her real-life hero, Larry, who silently puts up with the folderol of a writer’s life with few complaints. Visit Loree at www.LoreeLough.com. I couldn't really call this a review since having one of the characters in the book modeled after me leaves me naturally predisposed to liking the book. Fortunately though Loree's talent leaves no need for any such predisposition. Even so I though potential readers might benefit from my unique perspective on the book, so here we go ! Guardians of the Heart is book #2 of the Secrets on Sterling Street Series. Even though it shares common characters, and plot elements with book one “Guardians” stan I couldn't really call this a review since having one of the characters in the book modeled after me leaves me naturally predisposed to liking the book. Fortunately though Loree's talent leaves no need for any such predisposition. Even so I though potential readers might benefit from my unique perspective on the book, so here we go ! 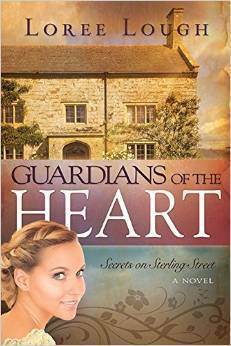 Guardians of the Heart is book #2 of the Secrets on Sterling Street Series. Even though it shares common characters, and plot elements with book one “Guardians” stands well on it own so you might as well dig in right here ! In it we meet Nell, who grew up watching every man she cared about killed in the gold mine her family operated outside Denver. She found herself years later needing a job, and a home. She answers a help wanted ad for a housekeeper from Asa, who is remodeling the Inn left to him by his grandparents. Asa was hauled off to the Civil War by his father. Still a boy he witnessed things that make the toughest grown man crumble. So by the time they meet, they have both spent years with buried secrets, that just don't seem to stay buried. They grow closer as they work together, but Asa' past in particular always seems to interrupt things. Its hard to put down Loree Lough book without feeling like you have made some new friends. Her characters are that real, and Guardians of the Heart is no exception. Its spooky to read where my character is introduced. For someone who has never seen me preach live, she has me and my preaching style pegged pretty close ! “Guardians” is also a prime example of Loree's talent for imagery. With exceptional detail she involves all five senses in transporting the reader to 1880's Denver. Having been on “the inside” of this and several of her books, I can tell you this talent is the result of unbelievable hard work. Loree understand the value of thorough research to great fiction. She spends many hours examining the sites, sounds, smells, culture etc. where each novel is set. Readers of “Guardians” will grow to appreciate this as they make their way through this story. Guardians of the Heart is book two in the series entitled Secrets on Sterling Street by Loree Lough. This novel is a heart-warming, Hallmark movie-worthy story set in the 1800’s in Colorado. The female lead, Nell Holstrom, is a strong, hard-working Christian woman who is the only member of her family left on earth. The Holstrom gold mine has taken the lives of her parents and younger brother, and she has no use for her father’s rumor that there may yet be hidden wealth inside. Very practical and Guardians of the Heart is book two in the series entitled Secrets on Sterling Street by Loree Lough. This novel is a heart-warming, Hallmark movie-worthy story set in the 1800’s in Colorado. The female lead, Nell Holstrom, is a strong, hard-working Christian woman who is the only member of her family left on earth. The Holstrom gold mine has taken the lives of her parents and younger brother, and she has no use for her father’s rumor that there may yet be hidden wealth inside. Very practical and committed to a work-ethic, Nell takes the job of housekeeper at the Stone Hill Inn. Asa Stone is the owner of the Stone Hill Inn, inherited from his grandparents. Though satisfied with restoring the inn and the routine of his life, he is plagued by guilt and remorse. His father had forced Asa and his three brothers to fight in a raid against the peaceful Arapahoe and Cheyenne Indians. Asa refrained from fighting, and his father and one brother died in the battle. He wandered the West for years, engaging in regrettable entanglements, before he settled in Denver at his grandparents’ inn. Upon their death he became the sole heir to the business, and the inn became his lifeline and purpose. Asa’s hiring of Nell Holstrom is fortuitous. Her hard work and creativity add to the beauty and functionality of the inn. They seem like the perfect business partners until tragedy strikes. Asa’s guilt hinders him from admitting his feelings for Nell. His mind tells him that he is not worthy of her, although his heart leads him to hope for a future. Together they overcome tragedy and try to rebuild their lives. There are many surprises and twists to their story. The book is a page-turner and an easy read. This work embraces the theme of forgiveness and the power of God’s presence in their lives. I highly recommend this book which I thoroughly enjoyed. I received this book through TBCN in exchange for an honest review. Nell Holstrom has no living family left. Her father’s mine in Colorado gradually took the lives of her mother, brother, grandfather, and father. Now she is left alone and is about to lose her job and home because her employers’ need to care for their Italian grandma. Miraculously, she comes across a notice advertising for a cook and housekeeper for the soon to open Stone Hill Inn. When she applies for the job, she meets Asa Stone, a silent and withdrawn man. Asa hires Nell who brings not only li Nell Holstrom has no living family left. Her father’s mine in Colorado gradually took the lives of her mother, brother, grandfather, and father. Now she is left alone and is about to lose her job and home because her employers’ need to care for their Italian grandma. Miraculously, she comes across a notice advertising for a cook and housekeeper for the soon to open Stone Hill Inn. When she applies for the job, she meets Asa Stone, a silent and withdrawn man. Asa hires Nell who brings not only light to his restored inn, but also light to his life. He is so afraid to get close to anyone for fear that his secrets of the past will be exposed. As they work together to bring the inn to life, they grow much closer. When a disaster strikes, both of their pasts come to light. The question is, will this draw them closer or further apart. This was a wholesome, engaging read which I finished in most of one sitting. The reader was quickly drawn to the plights of both Nell and Asa. I enjoyed the interjection of some history at the beginning with the involvement of Jesse James and the lesser known incident of Colonel Chivington ‘s Massacre at Sand Creek. The story moved along well in the beginning. I did feel that parts of the last quarter of the book were missing some details and were a little abrupt, perhaps I just wanted to know more. The door was left open for some sequels involving other characters in the early days of Denver. I loved loved it! Loree Lough is a fantastic Christian lady who writes awesome books that still has our beloved Father in Heaven in her stories. This is the main reason why I started reading Christian fiction. This book is action packed from the beginning to end! I love being able to travel back to the 1800's! This is also my favorite time period. Can you imagine standing there, hearing the clip clip or thudding of the horse's hooves on hard packed dirt, the roar of the storm as it was tearing D I loved loved it! Loree Lough is a fantastic Christian lady who writes awesome books that still has our beloved Father in Heaven in her stories. This is the main reason why I started reading Christian fiction. Can you imagine standing there, hearing the clip clip or thudding of the horse's hooves on hard packed dirt, the roar of the storm as it was tearing Denver up? I can because my imagination runs wild with me as I'm reading my books. Loree also writes about forgiveness and love. Asa and his papa are prime examples of what the author is talking about. To me, it takes a real man to admit that he's made mistakes in his past. Daniel has said he is sorry to children and told them how proud he is of them especially Asa. I was so proud of Daniel for doing that. Nell is an exemplary woman. While she is sweet and loving, she can also doing many thi ngs at one time! How she manages that I will never know! plus, she has a full time job! I wish I were a lot like Nell! Asa and Nell sure took a long time to figure out that they belong together! I was about ready to knock their heads together! But that is ok. God did it for us! Loree shows us that God does everything for a reason in His own time , not ours. Nell Holstrom is everyone's favorite person. She's always willing to offer a helping hand and an encouraging word. She's been on her own since the death of her father in the family's gold mine. But when she needs to find a new place of employment she applies at the old Stone Hill Inn. Asa Stone is attempting to restore his late grandparent's inn, but he needs help. And Nell's go-get-it-done work ethic is just what he needs to get Stone Hill Inn open. Asa is not an easy person to work with as he deals with the demons in his past. Guilt has been Asa's constant companion for years and he can't imagine life without it. But when nature turns against them Nell turns to what she left behind - a mine that slowly stole her whole family from her. But Nell is determined that Asa is just the man that she needs to get the mine back in operation and find the gold her father was convinced was there. Will the secrets of his past keep Asa from seeing himself as worthy of Nell? Or will his guilt drive him once again from the only home he has ever known? Guardians of the Heart is set in 1880s Denver and will appeal to anyone who likes a book that leaves you with a feel good feeling after the story is finished. Historical fiction fans will enjoy this set back in time. After an argument with his family, tragedy and guilt, Asa Stone thinking he did not deserve happiness, wondered around for years until he decided to return home to Denver to restore Stone Hill Inn that he inherited from his grandparents. Nell Holstrom's grandfather owned The Holstrom Mine where her family worked and were searching for that big strike. After suffering hardships and the death of her family, Nell Holstrom left her home and went to Denver searching for a job and a new life. When Asa advertises for help at the Inn Nell responds and is hired. They both have have guilt, secrets and heartaches to over come. I like how their relationship develops. Just when things seem to be going well devastation strikes. A story of overcoming life's challenges, romance, love and faith. This can be read as a stand alone book but I hope to read the first book in this series. Highly recommend this book. "Guardians of the Heart" was one of those books I didn't want to put down once I started reading it. I liked the characters of Nell and Asa so much that I just had to keep reading to find out what would happen. Nell had lost all of her family and was alone in the world but she was so generous and caring toward others, sometimes to the point of sacrifice. Asa was also a caring person but he has things that happened in his past that makes him think he will never be worthy - especially of a nice gir "Guardians of the Heart" was one of those books I didn't want to put down once I started reading it. I liked the characters of Nell and Asa so much that I just had to keep reading to find out what would happen. Nell had lost all of her family and was alone in the world but she was so generous and caring toward others, sometimes to the point of sacrifice. Asa was also a caring person but he has things that happened in his past that makes him think he will never be worthy - especially of a nice girl like Nell. But that doesn't stop him from loving her and although he cannot accept it, Nell loves him too. Well, life has a way of turning the tables on us and our best laid plans don't always work out. That is exactly what happened to Asa and Nell which made both of them face things from their past they had avoided. A few surprises along the way make for some interesting reading. Isn't it funny how God always seems to know what is best for us even better than we do? "Guardians of the Heart" is a very good historical romance set in early Denver, Colorado. I would definitely recommend it. I thoroughly enjoyed this novel occurring in Denver in the 1880’s. How easily I take for granted the modern luxuries I have! Nell shows how hard and strong the pioneer woman was! Nell has lost all family, as has Asa. They turn to each other to build a hotel business, and, along the way, discover they have feelings for each other. But Asa has secrets he doesn’t want to reveal (although the reader is privileged to learn them) and struggles to be a man worthy of Nell. On the other hand Nell is an 18 I thoroughly enjoyed this novel occurring in Denver in the 1880’s. How easily I take for granted the modern luxuries I have! Nell shows how hard and strong the pioneer woman was! Guardians of the Heart is a delightful historical romance novel. Set in the mid to late 1800s, readers are introduced to Asa and Nell as they navigate the streets of Denver together and yet so far apart. Asa is bedeviled by guilt from a long ago past. Nell is holding a grudge against her seemingly foolhardy mining family. Can they overcome their fears, face their shame and more importantly forgive others and themselves? Loree Lough laces her story with loveable characters, a sweet romance, a lit Guardians of the Heart is a delightful historical romance novel. Set in the mid to late 1800s, readers are introduced to Asa and Nell as they navigate the streets of Denver together and yet so far apart. Asa is bedeviled by guilt from a long ago past. Nell is holding a grudge against her seemingly foolhardy mining family. Can they overcome their fears, face their shame and more importantly forgive others and themselves? Loree Lough laces her story with loveable characters, a sweet romance, a little suspense (who is that smoking man with the long black coat?) and, of course, what Western novel be without a couple shoot-outs and a doc to fix everyone up? Guardians of the Heart is a story about dreams, hope, and forgiveness. An entertaining read, for sure. Nell needed a job and found one working for Asa at the inn he had inherited. But both of them are running from their past. Disaster sends Nell back to her family mine and Asa into despair. He doesn't feel like he can be the man that Nell needs in her life because of his past. The story flowed well and it was a quick read. The characters were entertaining and relatable. The two main characters were distinct and fit well together. I enjoyed several of the secondary characters as well. This is the s Nell needed a job and found one working for Asa at the inn he had inherited. But both of them are running from their past. Disaster sends Nell back to her family mine and Asa into despair. He doesn't feel like he can be the man that Nell needs in her life because of his past. The story flowed well and it was a quick read. The characters were entertaining and relatable. The two main characters were distinct and fit well together. I enjoyed several of the secondary characters as well. This is the second book in the series, but can definitely be read as a stand alone. The author took a sweet romance and mixed drama, faith, and history into it. Guardians of the Heart captured my attention from the first page. It is a heartwarming story with beautifully drawn and relatable characters. Spending a couple of hours with Nell and Asa was the highlight of my day and I could not put the book down. Nell is an especially likeable character and I found her optimism in the face of such trauma and hardship to be inspiring and refreshing. Asa is a dashing, multi-faceted hero with a richly woven tragic and compelling past. It was my first experience Guardians of the Heart captured my attention from the first page. It is a heartwarming story with beautifully drawn and relatable characters. Spending a couple of hours with Nell and Asa was the highlight of my day and I could not put the book down. Nell is an especially likeable character and I found her optimism in the face of such trauma and hardship to be inspiring and refreshing. Asa is a dashing, multi-faceted hero with a richly woven tragic and compelling past. It was my first experience reading a Loree Lough novel and I can certainly say that it will not be my last. With a long list of industry awards, it isn't likely this prolific author will ever retire...not even to her cozy li'l cabin in the Allegheny Mountains. She loves to hear from her readers and personally answers every letter sent to http://www.loreelough.com/.